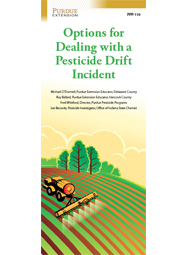 When any pesticide moves through the air away from the target site and onto someone else's property – known as pesticide drift – the pesticide can damage non-target crops, landscape plants, and gardens. This brochure examines when drift can occur, how to recognize it, and what to do if you suspect drift damage. Please limit your supply of free printed copies. If you need more copies, please order this item as a package of 25.